Published October 21, 2015 By Anna T. This post may contain affiliate links. Regardless, I only recommend sites I've researched and/or used and trust. Several years ago, I started writing reviews of smartphone apps that pay you. Back then, this was such a new thing because smartphones were a new thing. But here we are, at the end of 2015, and almost everyone has a smartphone. Because of this, apps that pay you are no longer a rare find. I love making massive lists, so today I felt a little ambitious and decided to see if I could come up with a list of 75 smartphone apps that pay. And what do you know, I was able to do it! Please note that almost all of these are available for both iOS and Android. For some of the listings, I may have linked the page for one or the other, but more than likely it's available for both types of devices. It's also true that these apps are not created equally. While I believe them all to be legit, some may be duds while others are pretty awesome. The reviews on each app will help you decide whether or not you should bother with them. But the one thing they all have in common is that they are all paying apps. So, have fun and good luck! These apps will all pay you to visit stores and do things like take pics of displays, answer surveys about what you see, etc. It's kind of like mystery shopping, but you do it with your phone. People who live in larger cities and towns will typically have more tasks available to do than people living in more rural areas. The following apps are best known for giving you actual cash back, via check or Paypal, for buying certain groceries. Some of them will also work at other retail locations apart from just grocery stores. These apps offer you an excellent way to increase your savings at the grocery store because you can use these in addition to coupons. These apps also involve shopping and store products, but they aren't as easy to categorize as the task-based and grocery shopping apps above. These apps are pretty much the same thing as Swagbucks and Inbox Dollars, but you do everything from your smartphone. You can earn money for watching videos, filling out offers, taking surveys, playing games, and a variety of different things. 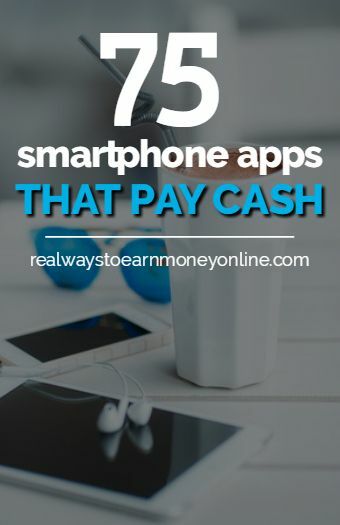 The are popular apps that will pay you in cash or rewards to simply download and try out new apps. This is a win-win because it allows you to earn for doing something that might already be fun, while also making it possible for app developers to get their apps in front of new users. App Trailers – This one pays you for watching trailers of apps, not downloading them. These apps pay you for using your smartphone to give your opinion on various products and services, just like any typical web-based survey panel. The only difference is that you're answering the questions from your smartphone. i-Say – Ipsos I-Say's mobile panel. More ideas for smartphone surveys that pay here. These are apps you can use to quickly and easily list your stuff for sale. These apps allow you to earn cash and rewards for keeping up with proper diet and fitness. The following apps are kind of unique in how you use them to earn cash and rewards and don't fit as well in any of the above categories, although several of these do track your location and activity (something not everyone will be comfortable with). Know of some more? Please comment below to share them with everyone else. I’ve used merchandiser by survey.com for a few months and recommend it to everyone. I love the app a lot and the employee’s that contact you to approve the task you requested are amazing! I’ve been paid up to $10 just for 10 min of my time to take a couple pice audits in a store on a product & answer a few questions. I’ve also been paid $15/hr just to restock planting seeds in a stores display. It’s very easy. Use my referral – loriBDR4 & you won’t regret it. They pay you 3 times a month, 1st, 10th, and 20th via PayPal. They state if Paypal doesn’t work for you to email the email listed to discuss other options too. It’s definitely a fantastic app for extra cash. Hey. I’m new here!! Your article is awesome ! I want to check it out the apps later! Do you have a referral code for Feature Points ? Cuz I would like for you to get some credit or a referral code for any of the ones on the list ? Hi Gary! Thanks for asking! I don’t have it installed on my phone anymore. I had it for a long time, but the app kept crashing and wouldn’t let me open it. I think it may work now that I updated my phone, but I haven’t gotten around to putting it back on. However, if you check this post, http://extracashandrewards.com/how-can-you-earn-with-the-featurepoints-app/, I think some people have left comments there with codes if you want someone to get credit. Thank you soooo much for doing this. Your emails and recommendations have been invaluable to me and have helped me to find extra work. I will definitely take a look at these and pass them on to my daughter who is looking to make a bit of extra cash. You’re welcome, and good luck! Thanks for putting this list together Anna. I’ve bookmarked it to go through later and see which ones I should try. Definitely passing this along. I use Google Opinion Rewards. The rewards are several cents. Sometimes anywhere between 10-30 cents a survey. And the surveys are few and far between. You may not get one for a few weeks. I get them every other day. There is no uptick in surveys if you answer more or less. Also, another neat way to earn money while doing nothing is Screenwise Trends. It’s also from Google. It’s basically an add-on you add to your Chrome browser. I added it to my tablet, phone and desktop browsers. Basically, you just use chrome. Screenwise records the frequency and pays you up to $3 if you’re using all 3 devices consistently. I forget it’s installed until I get an email about my usage. I already redeemed a $25 Game Stop reward. And another is on the way. The rewards take several weeks to arrive. But they have lots of rewards to choose from.